Cut piece of aluminum foil big enough to hold the burrito sized low carb Mission tortilla. Spread out pizza sauce. Cover with a light coating of oregano and add crushed pepper to taste. 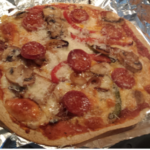 Add slices of mozzarella and top with mushrooms, peppers, pepperoni, etc. IMPORTANT NOTE: Prepared in this manner, the burrito will remain soft and the pizza must be eaten with a knife and fork. For a more crisp finish, place the low carb burrito in a toaster oven and toast for a few minutes before proceeding. Or, use the Joseph’s pita bread rather than the tortilla/burrito. *Fold up the aluminum foil one inch all around so sauce will not spill over during baking. **Turn the pizza 180 degrees halfway through the baking interval. ***Add the grated Parmesan or Romano cheese as soon as it comes out of the oven.